Q: Do you have a protectant on the table to prevent spills and stains? Q: Can I add another coat of sealer to it down the road for extra protection? A: Absolutely. Sand it down with a “fine” sand block (lightly) to get the small wear spots level all over and then apply a coat. You can use a polyurethane oil or water based product. Use a water base if for any tables (kitchen/dining) that you will be eating off of. 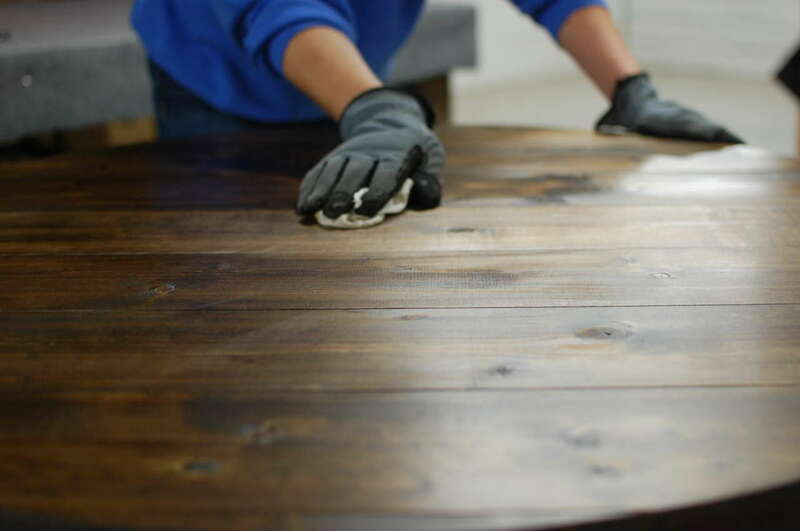 Never use all purpose cleaning sprays on the wood furniture (unless there is a plastic coating on top). If there are sticky spots on the wood, use a light, damp (little soap) to wipe and then use a dry, soft cloth to wipe the area. Color and natural veining will vary with each piece. Do not use any acidic or corrosive liquids on the tabletop. Keep away from extreme heat such as radiators or heating vents. If you notice small spots from wear and tear, get a light (fine) sanding block and lightly sand spots. Grab a sample stain (match your color as close as you can with stain colors in store/online), put a small amount of stain on a cloth to touch up the exposed spots. Let dry for 30 mixtures and then apply a sealer coat on top to hold the stain. If over time you see scratches appear from use, a great way to make them disappear is applying a paste wax. Wipe the wax in circular motion then let dry until it’s dull. Then wipe down again with a soft cloth until all the wax is gone. Keep zinc tops clean by using a little mild soap and water. There are no special cleaners needed on a regular basis; simply wiping down the surface daily will suffice. Do not use bleach or products containing bleach on zinc. Do not place anything over 200 degrees on the surface. Zinc is a soft metal and hot pots and pans will leave a mark. Use a neutral, pH-balanced cleaner, specially formulated for stone, on a regular basis to remove residues from every day spills, food, etc. Be careful with common foods and drinks contain acids that may etch or dull the stone surface. Food Spills – Scoop up the food and then blot a with dry, white cloth. Spray the area with a neutral stone cleaner and wipe off excess with a clean cloth. Liquid Spills – Blot away the excess with a clean, dry, white cloth while turning the cloth frequently. Spray the area with a neutral stone cleaner and wipe off excess with a clean cloth.